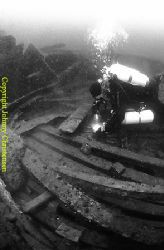 The wreck of the Carrie Leigh is resting in deep water by Grand Cayman. Image is shot from about 240 fsw. 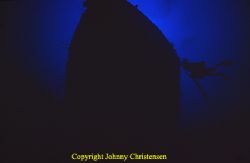 Used Nikonos V, but was really missing slower shutterspeeds than 1/30 sec. Right place, right time. 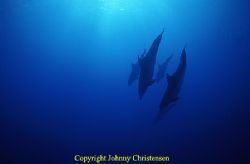 Dolphins are a rare sight on Grand Cayman, but I was in luck. In 3½ years on the island, I only saw them once. Image shot with Nikonos V and 15mm lens, Fujii Sensia 100 film. 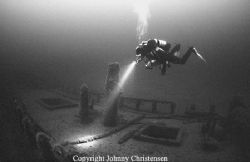 In the norwegian Flekkefjord, the wreck of Gudrun still has her spare steering wheel intact. Image shot with Nikonos V and 12mm fisheye lens, Sensia 200 film. Conning tower of a russian whiskey class submarine. Very similar to the german "Elektroboot" that could have changed the course of the second worldwar. Sitting intact at 38m near the island of Bornholm. Image shot on Sensia 200 with single strobe. 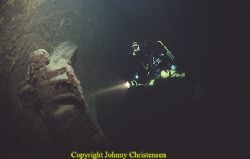 Diver from The Historical Diving Team of Denmark tries to bring awareness of our past. Image was shot on Agfa Scala B&W at 1600 iso. 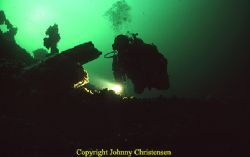 Inside the wreck of SS Director Reppenhagen. Long exposure, shutterspeed about 3 sec, camera was mounted on tripod. Single strobe on low setting, to get the timber on the bottom to blend in. Going thru the debris, Michael is on a tresure hunt for souveniers. Patience pays off, when he locates the steam whistle. Image shot on Agfa Scala B&W at 1600 iso and only very little strobelight to avoid backscatter. 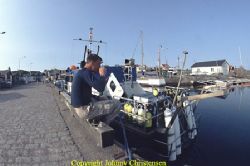 Humbled by the size of the anchors from the wreck of CF Liljenvalch. 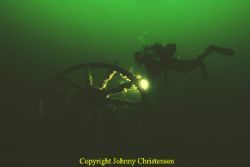 My buddy hovers at 55 meters, trying to grasp the dimensions of this massive wreck, that is now resting in the Baltic Sea. Fujii Sensia 200, single strobe. 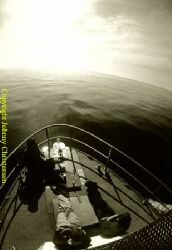 Sailing to the divesite in calm conditions is a rare treat. 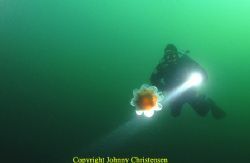 Diver keeping his distance to a stinging jellyfish. Sensia 200 film and very little strobelight. Nothing lasts forever. Though the dive was great, it was time to go up. Image shot on Agfa Scala B&W at 1600 iso. I always save one last frame on the film to the end of the dive. Quite a few times, it pays off. 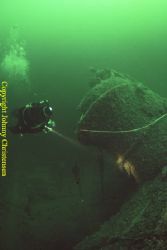 The wreck of S/S Molkte in the baltic sea. Time has taken it's toll on this once proud ship. Walls has broken down, creating swimthru's for divers. Image was shot with handheld camera, using Agfa Scala B&W 1600 iso. In cold and dark water, there is plenty of excitement to be found. 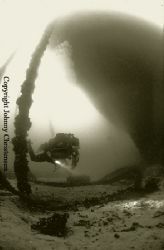 Shot this picture on a wreck in 25 meters of water. Used a standard Sensia 200 to get the right kind of green colour. 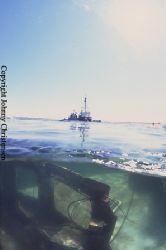 During a salvage operation, this little wreck was raised from 38m and put in shallow water for further work. 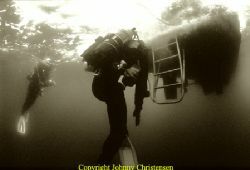 Spend a week following the divers, and shot picture series for a feature article in DYK, The Scandinavian Diving Magazine. 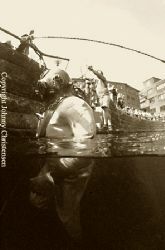 This oldfashioned diver attracted lots of attention from the crowds. Shot on Agfa Scala B&W at 1600 iso to give it a old and grainy look. 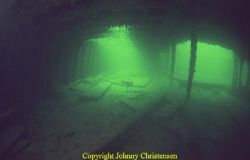 Affaire is a 112 years old wreck, still nicely preserved in the Baltic Sea. 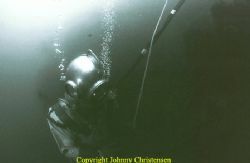 The depth was 42 meters, so I used a 1600 ISO B/W film to capture the dim light. 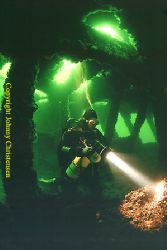 There is only a slight touch of strobe light on the diver. Everything else is ambient light. 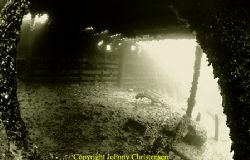 Inside the wreck of the Vendée on a sunny day. The shot was taken with long exposure and camera was mounted on a tripod. Requires really good working relations with your model, that kind of pictures takes a lot of time to getting it right.